Issue: Kyoto is fading and carbon trading is a farce. Recognizing this, OECD states can either “bite the bullet” and adopt socially-responsible policies to dramatically cut fossil fuel use and useless consumption or, they can hope for a “silver bullet” – some new techno-fix that might let them have their cake and eat it too. The silver bullet may be winning. At the UN’s Intergovernmental Panel on Climate Change, the US government is lobbying for “geoengineering” activities such as deliberately polluting the stratosphere to deflect sunlight and lower temperatures. 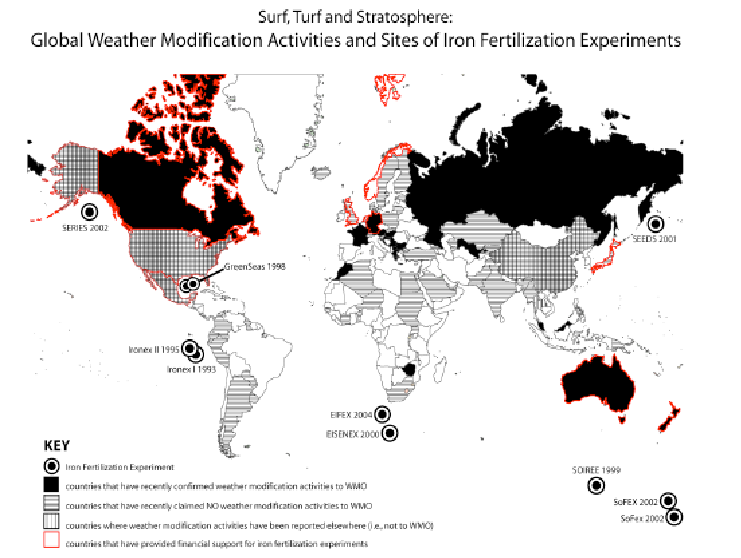 At least 9 national governments and the European Union have supported experiments to spread iron filings on the ocean surface to nurture plankton and sequester carbon dioxide. At least a dozen additional countries are involved in stratospheric weather/climate modification. Commercial carbon traders are engaging in ocean fertilization as well. The scientific debate and the government/commercial experimentation is taking place, once again, in the absence of public discussion. Impact: The “proof of principle” that we can indeed geoengineer the earth’s climate is beyond dispute. That’s why we have climate change. However, the notion that we can successfully correct our unintentional destructiveness with intentional geoengineering seems ludicrous. For the governments who caused the problem to experiment together on geoengineering solutions – outside the UN and without the participation of the South who bear the brunt of global warming and would likely bear the risks of geoengineering – is a grave miscalculation. Fora: In 1978, at the request of the USA and USSR, the UN General Assembly adopted the Environmental Modification Convention (ENMOD) prohibiting governments from using weather or climate as a weapon against other states. The UN General assembly must reopen debate on its 1978 Treaty in the light of new technologies and new private and public initiatives underway around the world aimed at restructuring the stratosphere and/or the oceans to the advantage of some governments and the disadvantage of others. Other UN agencies dealing with the impact of climate change must also address this issue. This includes the Intergovernmental Panel on Climate Change (IPCC), UN Environment Programme (UNEP), UN Convention on Biological Diversity (CBD) and the UN Food and Agriculture Organization (FAO). Policies: The United Nations must reaffirm (and, if necessary, expand) the Environmental Modification Treaty recognizing that any unilateral modification of weather or climate is a threat to neighboring countries and, very likely, the entire international community. Experimentation that could alter the structure of the oceans or the stratosphere should not proceed without public consent and UN authorization. The IPCC should revisit the concept and practice of carbon trading and replace this market-based “solution” with direct measurable standards for CO2 emission reduction at source. OECD states must redouble their efforts to reduce their consumption of fossil fuels and to curtail other wasteful practices that contribute to global warming. The issue of geoengineering and its far-reaching social, ethical and political implications should be on the agenda of the UN Framework Convention on Climate Change, 3-14 December 2007 in Bali, and the World Meteorological Organization’s 15th Congress in May 2007.